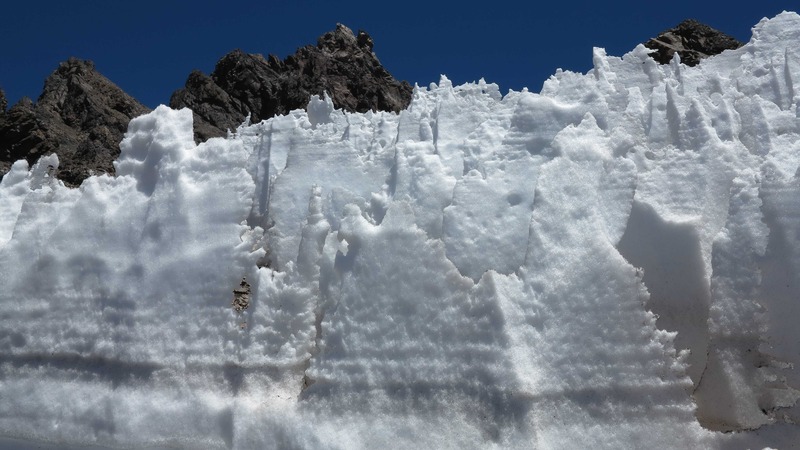 We are starting our expedition to Aconcagua tomorrow morning (15 January) if all goes well – today the road to the mountains was closed by a mudslide but it should be cleared by tomorrow morning. We will be back online some time in the beginning of February. 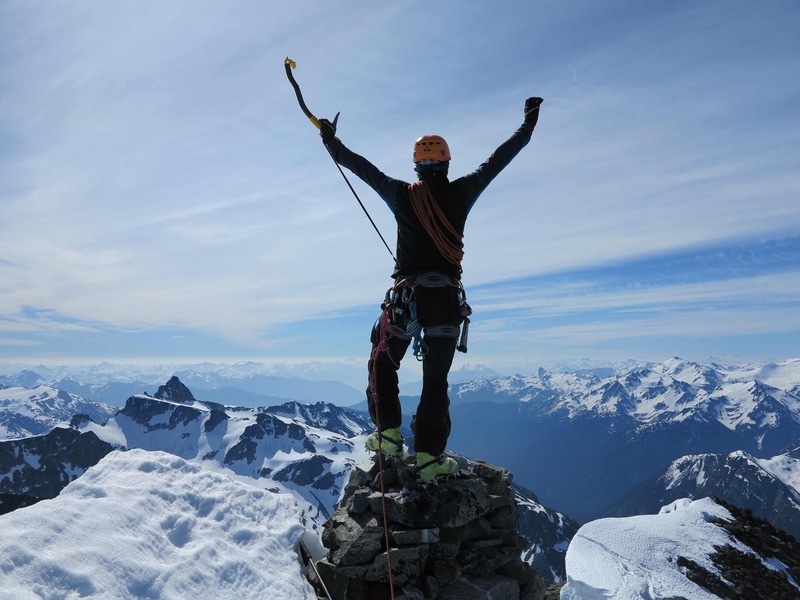 Our egos want the summit but our souls long for the climb! 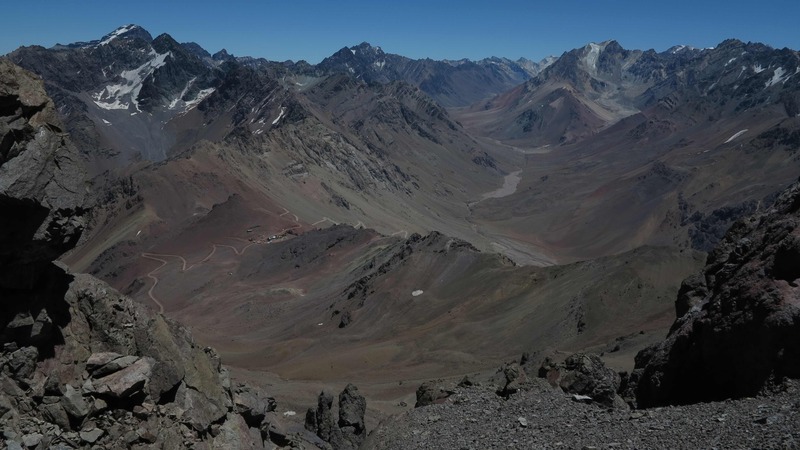 From Vallecitos, we drove up the long valley towards Chile. We stopped for the night at Puente del Inca where we found a bit of shelter for the very strong wind. Below, Frida is parked under an incredibly blue sky in the small village of Puenta del Inca. Puente del Inca in the early morning before the arrival of the tourists and the opening of the souvenir shops. 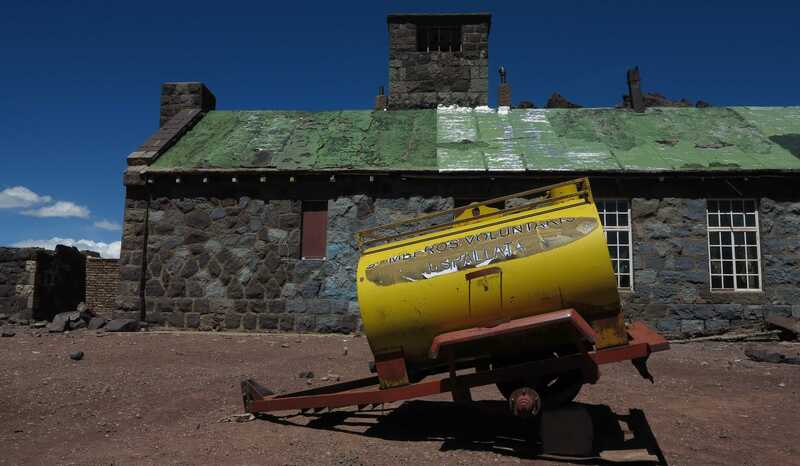 There is something strangely attractive about remote and deserted places like this. We drove up to Cuevas on the border to Chile. 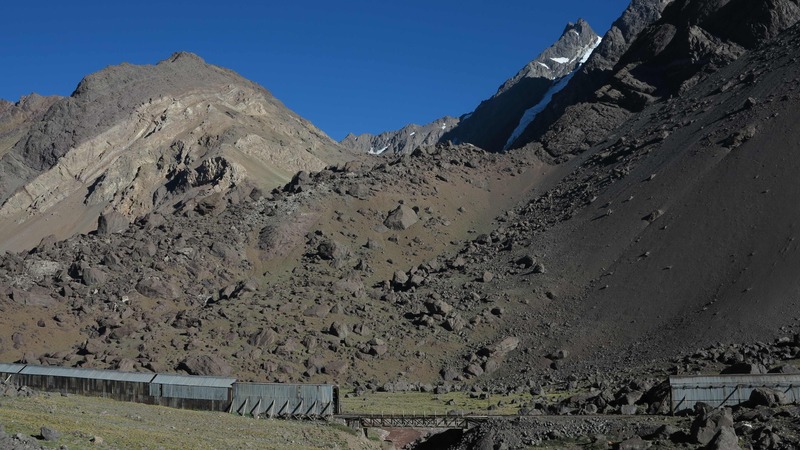 This is the remains of the Transandine Railway which used to cross from Argentina into Chile over the Andes. It worked until the mid 1980’s and it must have been both a spectacular and a scary ride. 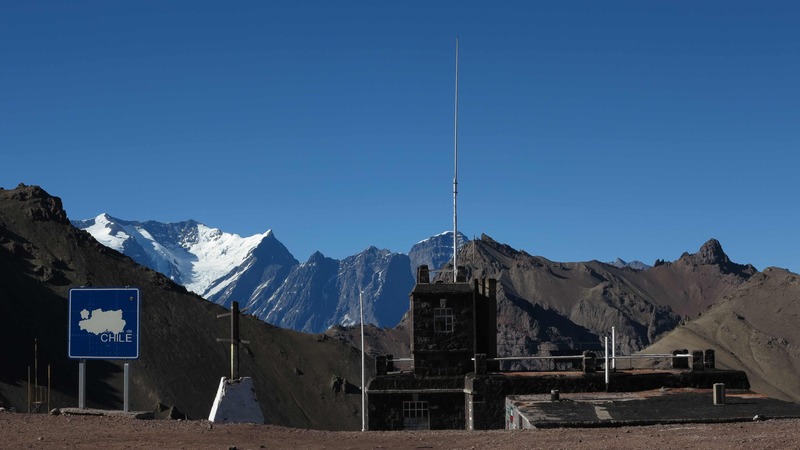 The Argentinian border station. 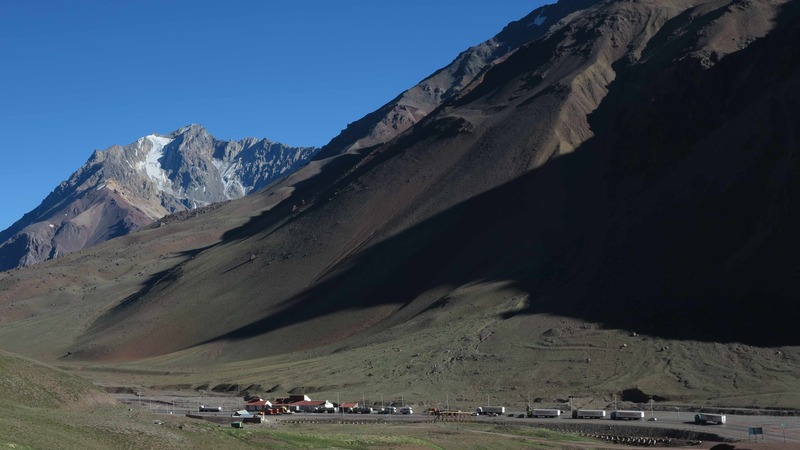 From here, a long tunnel takes you under the rocks into Chile. We took the old dirt road up to the high border station in the pass. Welcome to Chile! It was incredibly windy but the view was fantastic. 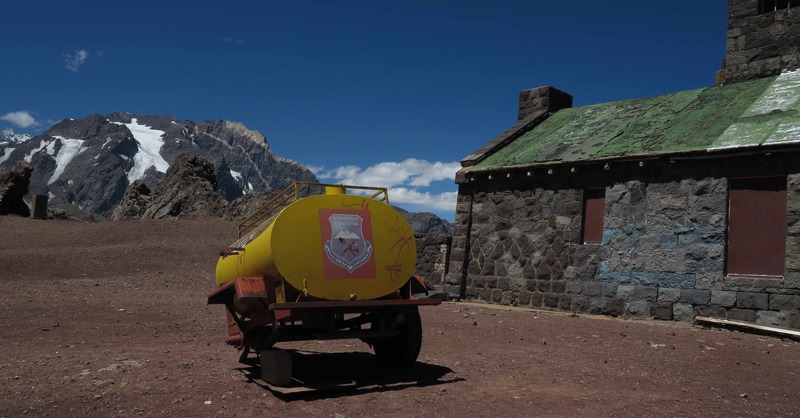 The station of the Bomberos Alta Montana, Uspallata (the high mountain fire brigade). We hiked up the Santa Helena mountain. 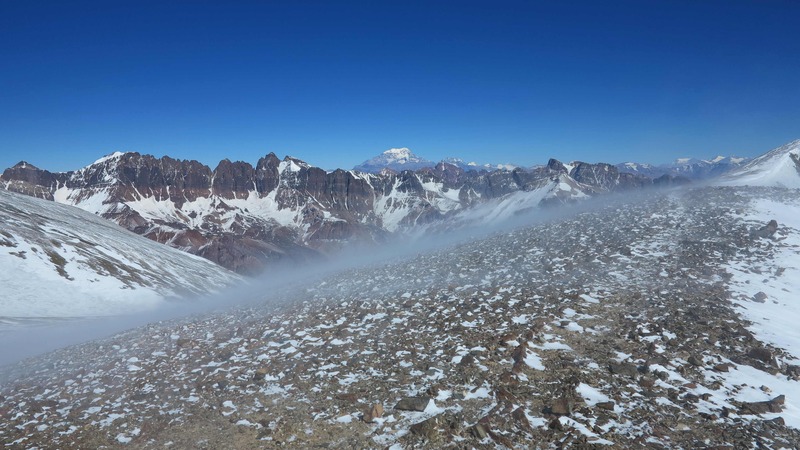 Here with a view down to Argentina on the right and Chile on the left. 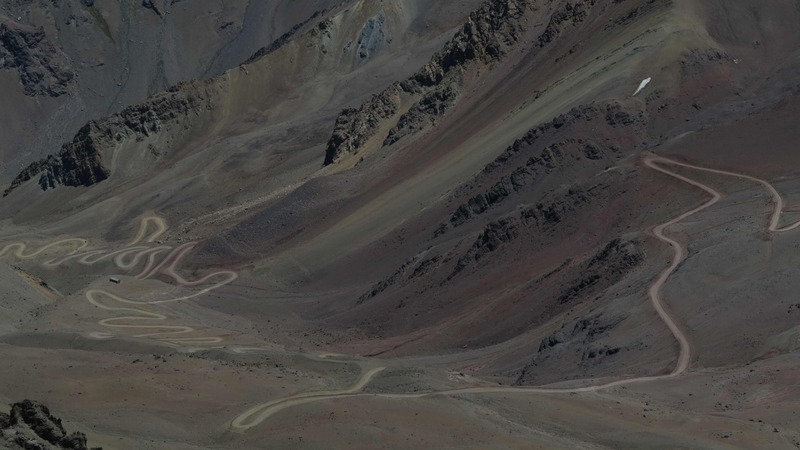 The road into Chile. This is the kind of road that Frida likes to drive! 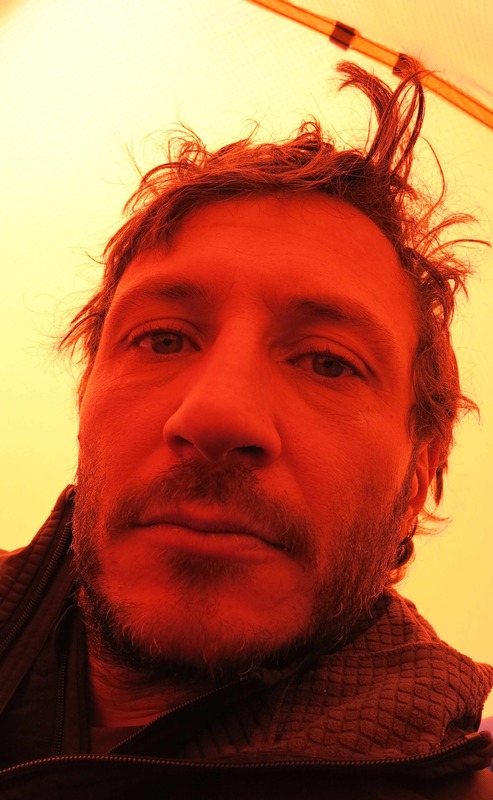 Marco enjoying the panorama and trying to keep his balance against the strong wind blowing from Chile. 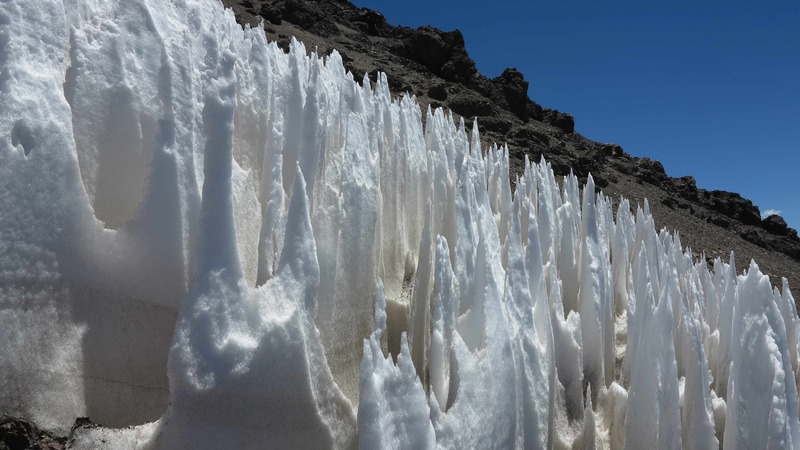 Penitentes at 4300 m. Penitentes are ice structures which usually form at high altitude (above 4000 m) and are found only in the dry part of the high Andes between Chile and Argentina. Walking up the beautiful valley of Vallecito, testing our new 95 liter rugsacks and warming up the legs for Aconcagua. 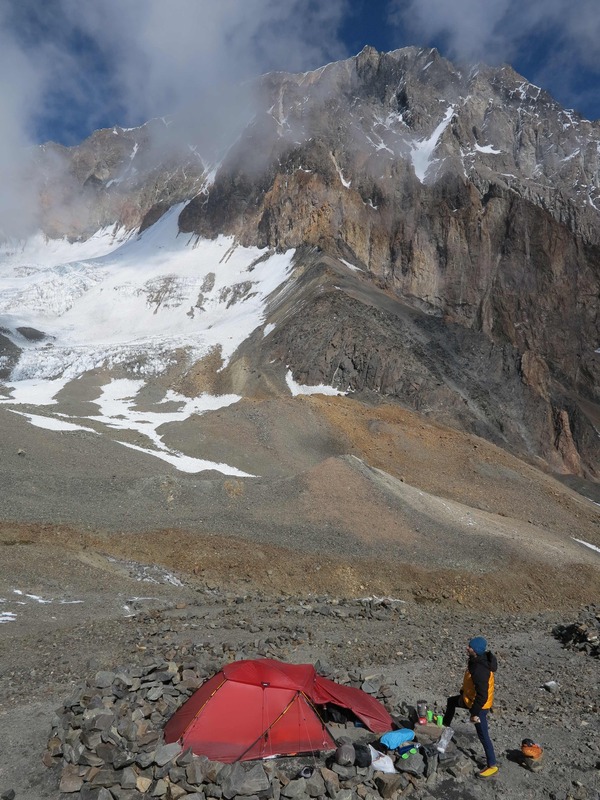 We set up camp in this beautiful spot at 4600 m. In the background Pico Vallecitos, 5475 m.
In the night we had a bit of snow. The next morning the valley was even more beautiful to view! In brilliant sunshine we walked further up the valley. Unfortunately there was also a strong storm blowing so we could hardly walk and had to abandon the idea to reach the top of either Vallecito or Plata. Our tent is down there to the right in the picture somewhere. 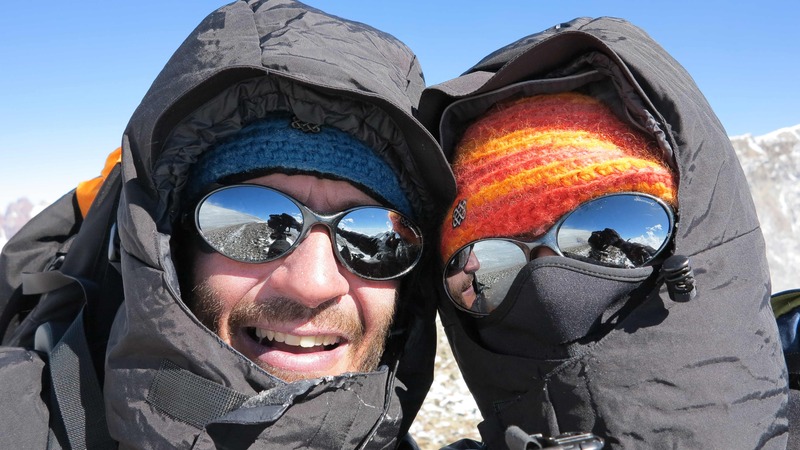 Photo in the pass at 5200 m. Maybe it looks warm and sunny but it was cold! Today Frida turned 50! She has behaved very very well the last year and was rewarded with beautiful birthday weather. 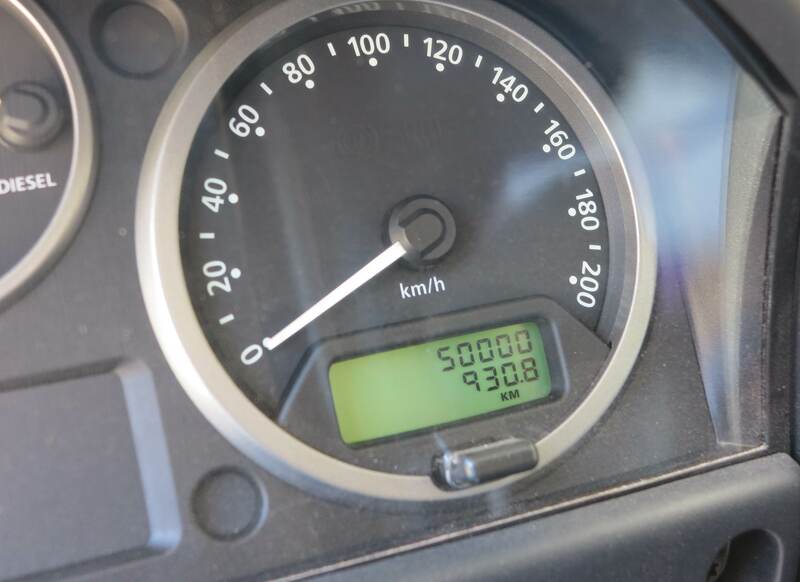 Frida, we are ready for the next 50.000 km with you! Celebrating Frida’s birthday under a deep blue sky in the Andes of Argentina. 50.000 km in less than one year! Frida has worked hard but she still looks like a young lady! Our roof top terrace in Palermo Viejo – sunset, Torrontes wine and picadas. Maradona started his career in the famous Boca Junior Club. Here with the truffaldini of Bergamo! A well kept Fiat 600 – Argentina is the country of the very old Fiats, Renaults and Ford Falcons. Beautiful tiles in an old building. Plaza de Mayo in front of the Casa Rosada in central Buenos Aires. The white shawl of the “Mothers of Plaza de Mayo” is painted on the square. They represent an organization of mothers whose children disappeared during the “Guerra Sucia”, the dirty war in the 1970’s during the years of the the military dictatorship. We went on a day trip to Estancia Ombu 130 km outside Buenos Aires. Horse riding at the estancia. Here Malene’s mother in elegant gaucha style! Malene’s mother with Oscar who ran away from home at 11 years old to become a gaucho. The horse seems to be the only one who is not enjoying! Christmas eve! We enjoyed a fantastic Christmas dinner at Cabanas Las Lilas. Here Malene’s mother with a big steak and a very big knife! And after the dinner, more Danish traditions! The “nu-er-det-jul-igen” dance around the house…. It all ended in chaos but everybody enjoyed, especially the photographer! The famous argentinian asado prepared by Fernando (former Puma – national team rugby player for Argentina). The Iguazu falls on the border between Argentina and Brazil is a 2.7 km wide water fall or rather series of numerous water falls tumbling down over the edge of the Parana Plateau. The falls are 60-82 m high and there are around 150-300 individual water falls depending on the water level in the Iguazu River. The Devil’s Throat – Garganta del Diablo – the largest water fall of the Iguazu Falls, 82 m high and 150 m wide. About half of the water of the Iguazu River flows through this narrow passage and creates a roaring chaos of water and steam. The top of the Devil’s Throat where the quiet river transforms into a roaring water fall. Looking down the river from Devil’s Throat. To the left is Argentina and to the right Brazil. One quick picture! Getting completely wet at Devil’s Throat. Walking along the Iguazu Falls. From Cachi we took the Ruta 40 to Cafayate to check out the local wines. Little did we know that we would end up eating the wines as lovely sorbets from the local artisan ice cream shop Miranda. We would return to Cafayate just to have more Miranda ice cream! Ruta 40 runs from north to south through the center of Argentina. The road is a little bit bumpy in places but the landscape is beautiful. 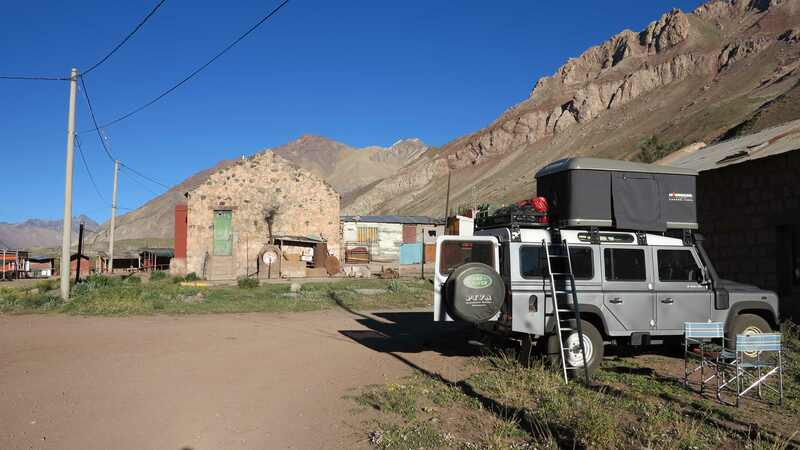 We arrived to Cafayate and set camp in the hills above the city. Fantastic view and very peaceful. The next day we did a very hot training-hike to the big cross on the Cerro San Isidro above the city. Here a view down to the vineyards below. The cactus were in bloom. We were not alone! This dog “picked us up” on the square in Cafayate and followed us all the way to the top, more than 1000 m altitude gain! She was incredible!!! On the top with an exhausted dog. After we returned to the square she was hoping to get adopted and jump in Frida with us……it was very hard to leave her there! Before retreating to our camp in the hills, we had 1/2 kg of home made ice cream each from the local ice cream store Miranda! The wine sorbet was invented here and we tasted two of the local grapes as sorbets: Torrontes and Cabernet. Incredible!! Also the dulce de leche ice cream was unforgettable…. 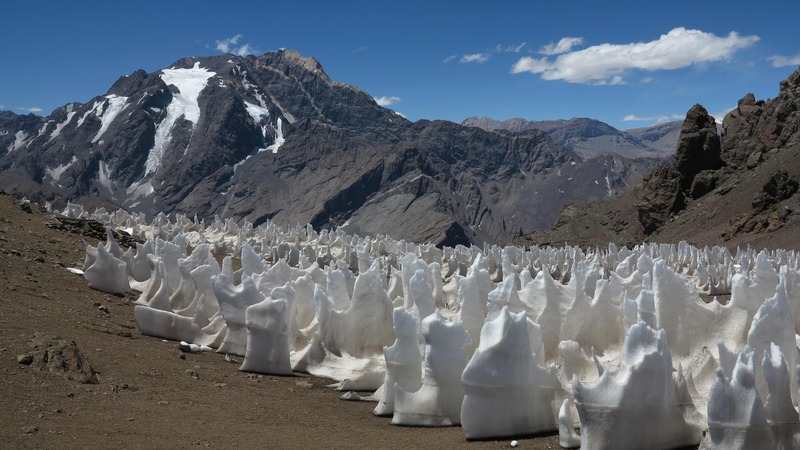 We entered northwestern Argentina from Chile over the beautiful Paso de Jama. 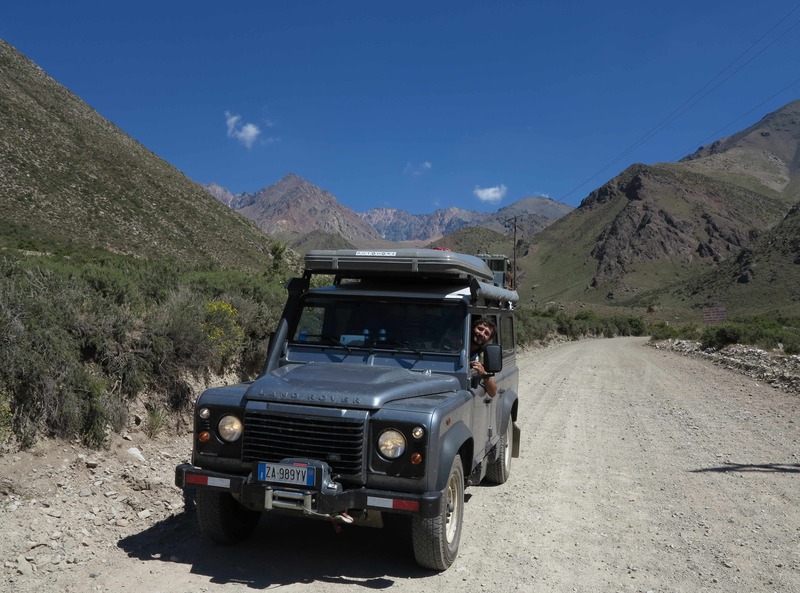 We spent a couple of nights in Salta and then drove to Cachi to do some trekking in the mountains. 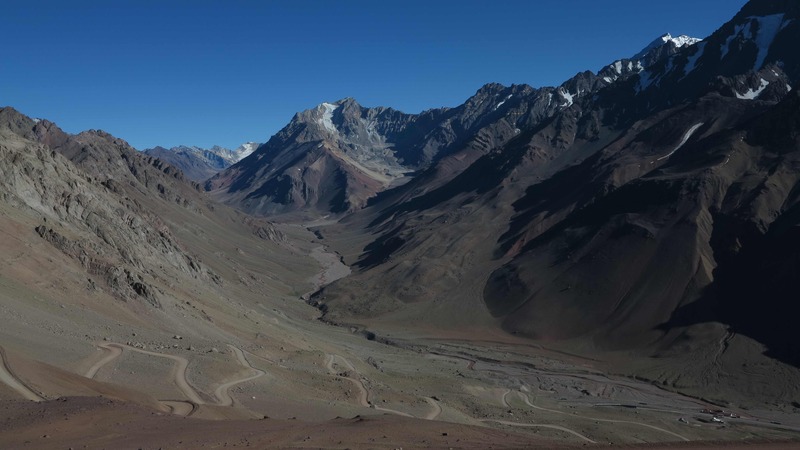 The road to Cachi through the beautiful Parque Nacional Los Cardones. 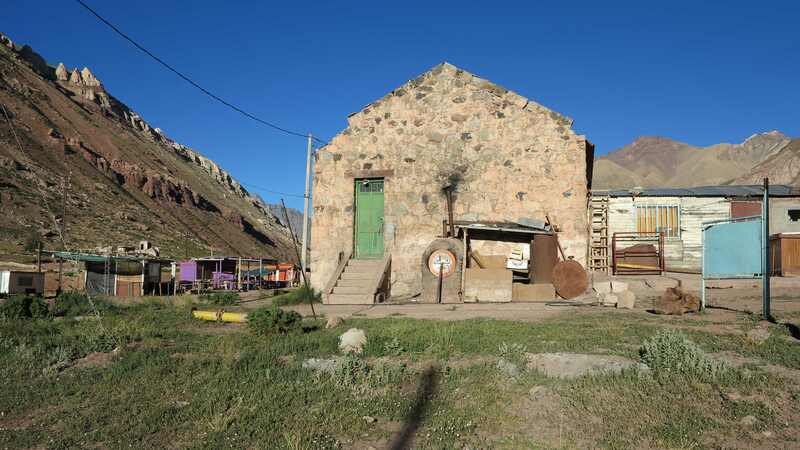 From the small village of Cachi we drove up past Pailas and camped in the valley at the end of the road. This is the valley where we were going trekking. Beautiful! 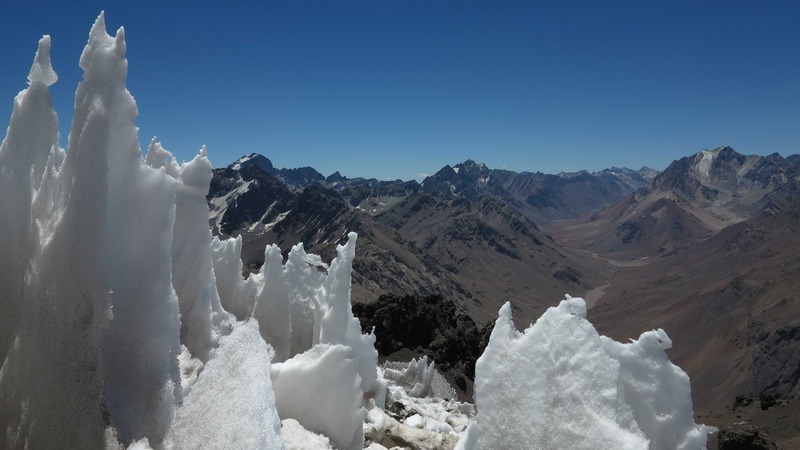 Nevado de Cachi is somewhere in the background, behind the first line of peaks. 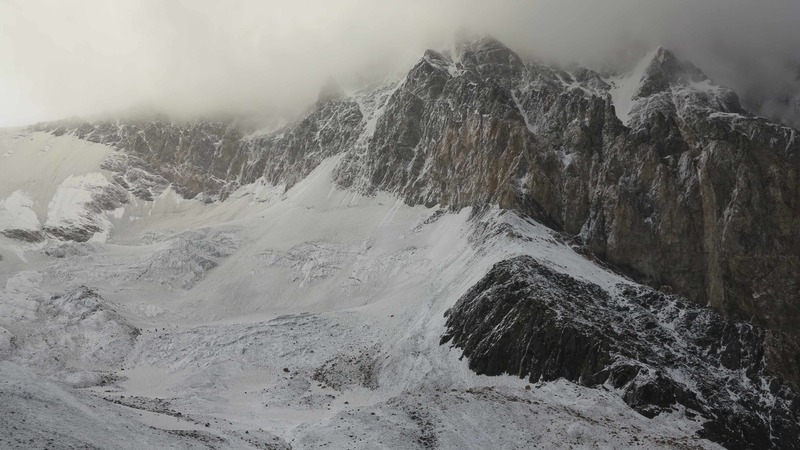 We hiked up 1600 altitude meters and set camp at around 4550 m. Just in time…. As we raised the tent it started raining and soon we were in the center of a very bad thunderstorm. 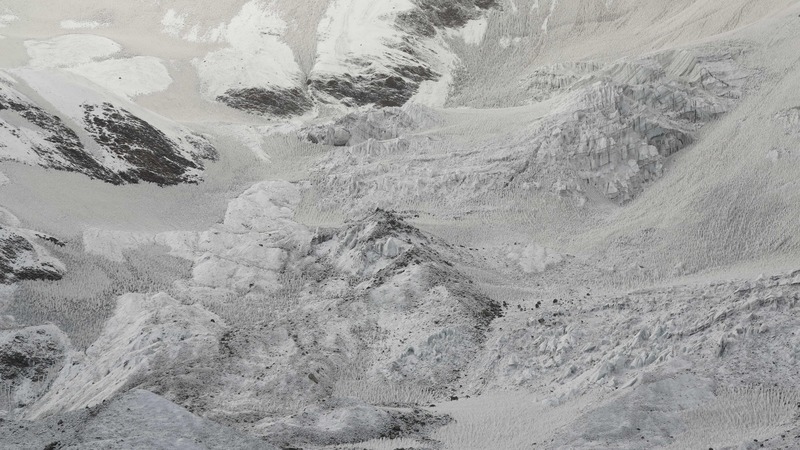 This is how the landscape looked after! We enjoyed the sunset and the next morning we walked down again! Nice picture, better night and even nicer face of Maline when she tested the mollejas. We enjoy it a lot!! It was an experience!!! The mollejas…hmmm. I am still dreaming of the chori pan…..slurp! It was fantastic!!! Thank you!!! Para Malene y Marco: feliz ano nuevo. Ada y familia en Svendborg. Kære Ada, tusind tak og rigtig godt nytår tilbage til dig og familien! Vi fejrede nytårsaften i bjergene og er lige kommet ned idag for at tage bad og spise en god bøf! Kærlig hilsen fra os begge!